Young-Earth creationists claim that the Paleozoic sedimentary rocks in the Grand Canyon and the Mesozoic sedimentary rocks of the Grand Staircase north of the canyon, in which Zion and Bryce Canyon National Parks occur, were deposited during Noah’s worldwide flood about 4,500 years ago (Hill 2002; Hill and Moshier 2009). I realize that readers of Skeptical Inquirer accept modern scientific views on this subject, but this examination of the creationist claims might be useful when communicating with others less imbued with scientific thinking. There are at least twenty-one scientific reasons a worldwide flood recounted in the Bible cannot have happened. The stair-stepped appearance of erosion of sedimentary rocks in the Grand Canyon with sandstones and limestones forming cliffs and shales forming gentle slopes cannot happen if all these rocks were deposited in less than one year. If the Grand Canyon had been carved soon after these rocks were deposited by a worldwide flood, they would not have had time to harden into solid rock and would have been saturated with water. Therefore, the sandstones and limestones would have slumped during the carving of the canyon and would not have formed cliffs (Hill et al. 2016). Salt and gypsum deposits, more than 200 feet thick, occur in the Paradox Formation in Utah just 200 miles north of the Grand Canyon, and these deposits are the same age as the Supai rocks in the Grand Canyon that were supposedly also deposited by Noah’s flood. Similar salt deposits, up to 3,000 feet thick, exist in various places on all continents and in layers of all geologic ages, and these deposits can only be produced by evaporation of sea water. Such evaporation could not have happened in repeated intervals in the midst of the forty days and forty nights of raining and during the supposed continuous deposition of sedimentary rocks by a worldwide flood and in which the only drying and evaporation is said to have occurred at the end of the flood (Collins 2006; 2009; 2012; Hill et al. 2016). Sand dunes with giant cross bedding occur in the Mesozoic rocks in Zion National Park and are further evidence that desert conditions occurred at the time of the supposed flood (Senter 2011; Collins 2017). Fossilized mud cracks occur in the Cambrian Tapeats Formation on top of the Precambrian Vishnu schist at the bottom of the canyon and indicate that drying conditions existed during the alleged worldwide Noah’s flood, and these drying conditions occurred at the very beginning of this supposed flood. Although mud cracks can also form in mud under water by compression that squeezes out water from the mud, such compression is not likely to occur during a flood. Moreover, fossilized mud cracks are found in other formations that were supposedly deposited during Noah’s flood, and these mud cracks occur in red shales that coexist with salt and gypsum layers. Therefore, these mud cracks were likely formed in deltaic mud flats that were exposed to the atmosphere where their iron-bearing minerals reacted with oxygen in the air to form red hematite (Collins 2006; Senter 2011; Hill et al. 2016). Raindrop prints occur in many places around the world, which could not have been formed or preserved if the muds (now in shales) containing these prints were deposited under water during Noah’s flood (Senter 2011; Hill et al. 2016). Nests of dinosaur eggs are found in several places around the world, and it is illogical that dinosaurs could have had enough time to create these nests and lay their eggs while they were fleeing from rising waters to reach higher ground (Senter 2011; Hill et al. 2016). The White Cliffs of Dover on the eastern coast of England consist of chalk layers, up to 350 feet thick, that are composed of fossilized coccoliths (a kind of algae), and these layers are the same age as the sedimentary rocks that overlie giant cross-bedded sandstones in Zion National Park. Therefore, they were supposedly also deposited by Noah’s flood. 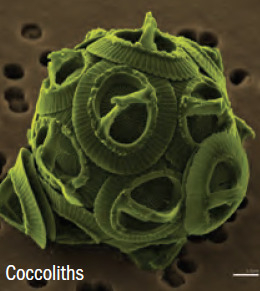 But coccoliths are very tiny and have chloroplasts that require sunlight and must float close to the ocean surface to get energy from the sun. Because of this, all of them could not have been living at the same time to depths of 350 feet in the one year in which the flood is said to have occurred because that many organisms in the water at the same time would have blocked out the sun from organisms below the near-surface (Collins 2015a). Up to 4,590-foot thicknesses of radiolarians occur on the Pacific Ocean floor. Radiolarians are tiny marine organisms with silica skeletons; they contain chloroplasts and must float near the ocean surface to obtain sunlight. The rate at which dead radiolarians settle to the bottom of the ocean is too slow for that thickness and number of radiolarians to accumulate in the 4,500 years since Noah’s flood. Although radiolarians are not found in the sedimentary rocks of the Grand Canyon, fossilized radiolarians are common in sedimentary layers in other parts of the world of the same geologic age, and each of these layers contains distinctly different radiolarian species that are among more than 4,000 different species that have been identified. Chaotic rushing waters of a tsunami in Noah’s flood would have been unable to sort out these different species in different geologic ages from those living early in the flood to those created late in the flood (Collins 2015a). None of the sedimentary rocks in the Grand Canyon contains fossilized pollen grains that are produced by grasses, pines, and flowering trees and plants, whereas these same rocks in the canyon contain only spores of algae, ferns, moss, and fungi. A worldwide flood would be expected to mix these tiny structures if all were alive at the same time of Noah’s flood, and this mixing did not occur. How can a rush of water in a tsunami sort out and separate such tiny reproductive structures from each other? (Hill et al. 2016). The Redwall limestone in the Grand Canyon contains billions and billions of jumbled sea lily (crinoid) fossils in multiple layers, and such marine animals would have had to grow on stalks on the ocean floor and cover the whole Earth at space intervals of one foot apart if all were alive at the same time during Noah’s flood. That distribution and abundance is extremely unlikely in less than one year’s time. Moreover, there would have been the need for already available, precipitated, calcium carbonate crystals somewhere to be carried into the Grand Canyon area to be deposited as limestone to host these fossils. This seems highly unlikely because the source of the calcium requires long periods (tens of thousands of years) of chemical weathering of calcium-bearing rocks, such as basalt lava flows, to produce such a large volume of limestone that extends, not only in the Grand Canyon, but also in the Redwall limestone across most of western and central United States in buried sedimentary layers (Collins 2015a; Hill et al. 2016). If all limestones were deposited by Noah’s flood during a giant tsunami, then all limestone layers should show evidence of fossils being jumbled by rushing water. This is not the case. The presence of Silurian limestone layers that are older than the Redwall limestone occur with consistent sequences at constant thicknesses over hundreds of square miles in Illinois, Iowa, and Wisconsin, and they lack any fossils in a jumbled array. These consistent thicknesses indicate that these limestone layers could not have been deposited by a tsunami, and these layers could only have been formed in quiet water by slow chemical precipitation of the calcium carbonate during tens of thousands of years. Thus, the limestones around the world, alleged to be deposited by Noah’s flood, were not deposited by a rush of flood water in a tsunami in less than one year. Many other examples occur in sedimentary rocks around the world where fossils of communities of many different marine animals are totally undisturbed (Senter 2011; Collins 2015a; 2017). Abundant fusain (charcoal) is found in several different sedimentary rocks around the world that were supposedly deposited by Noah’s flood, which is good evidence that a worldwide flood never happened. Fires that burn forests are not likely to occur in the midst of forty days and nights of rain (Senter 2011). River terraces exist on the sides of Colorado River canyon walls that give ages of deposition at the top of 350,000 years and at the bottom of 38,000 years, and these ages were determined by two entirely different methods and are much beyond the 4,500 years that young-Earth creationists claim is the age of the sedimentary rocks deposited during Noah’s flood (Collins 2015b; 2017). Scientific observations and measurements show that the canyon of the Colorado River was eroded by rates of 80 to 458 meters per million years at different places along the canyon (Collins 2015b; 2017). The coarsely crystalline Zoraster granite occurs in the Vishnu schist in the bottom of the Grand Canyon. Experimental work shows that coarse crystals in granite are formed only at depths of five miles or more in the Earth’s crust and that at these depths, the rate of cooling of rock melts (magma) at temperatures of more than 800 degrees C require at least 5 million years before temperatures are low enough that crystals can start to form and slowly increase in size. Therefore, the age of the Earth must be more than 6,000 years and much older than when Noah’s flood supposedly occurred (Collins 2017). The rate of erosion of the Zoraster granite in the floor of Colorado River in Grand Canyon, as measured by how fast the erosion occurs on a yearly basis from year to year, is about a thousandth of an inch per year. This means that the carving of the Grand Canyon took millions of years—not less than a year in a sudden rush of water draining from three lakes at the end of Noah’s flood (Collins 2017). The average thickness of sedimentary rocks around the world in the continents that were supposedly deposited by Noah’s flood is about 1,800 meters (5,905 feet) (Nelson 2012). If just 1 percent of this thickness represents fossil remains of marine animals that were alive at the same time during Noah’s flood, then the whole world would have been covered with 59 feet of living marine animals, such as clams, snails, corals, trilobites, and sponges. That many animals living at the same time during that single year would have been impossible. The value of 1 percent is not unreasonable when some limestone layers are composed of nearly 100 percent fossils. Even if 0.1 percent of the sedimentary rock thickness contained all marine animals that were alive at the same time in the year of Noah’s flood, that means that the whole world would have been covered with 5.9 feet of animals, and that still is too many animals. The impossible numbers of fossils of coccoliths (Reason 7), radiolarians (Reason 8), and sea lilies (Reason 10), are illustrative of this fact. Moreover, if only one out of 10,000 animals living on the land (amphibians, reptiles, birds, and mammals) are preserved as fossils in the sedimentary rocks deposited by Noah’s flood, then Noah would have had no space in which he, his family, and cattle could have existed with all these creatures living at the same time, particularly if tens of thousands of huge dinosaurs were alive when Noah lived prior to the flood. An experiment done by Charles Munroe III shows that the submergence of an olive tree under water for more than three months kills the tree. On that basis, when a dove brought an olive twig with fresh leaves to Noah on the ark (Genesis 8:11), the whole world could not have been submerged under water during the flood. Otherwise, all olive trees would have been killed in six months of their submergence under the flood waters. Therefore, the flood must have been local in southern Mesopotamia with some land (say, 100 feet above water) present on which olive trees must have been growing and from which an olive tree with such a twig with fresh leaves could have been obtained by the dove (Collins 2017). Wave action at high tide from a powerful category 5 hurricane with sustained winds of more than 156 mph can move an offshore barrier sandbar as much as 50 to 100 feet inland toward the continent, but such a major storm never moves sand for distances of thousands of miles across the United States, as creationists claim for the Tapeats, Coconino, and other sandstone deposits in the Grand Canyon or the calcite grains and fossils in the Redwall limestone. Therefore, producing such deposits by such winds and waves in Noah’s Flood has no scientific support. Noah’s ark could not have survived such wind power and large waves. Moreover, moving water cannot carry such large, suspended sediment loads for that distance (Collins 2015a; 2017). The claim that the erosion surface that underlies the Cambrian Tapeats sandstone on top of the Precambrian basement rocks, which forms a major unconformity at the bottom of the Grand Canyon, was caused by a tsunami makes no scientific sense. A tsunami-created wave is caused by either a) a large earthquake following a sudden fault movement that shifts the position of the ocean floor; or b) a giant explosion of a volcano in an oceanic region, such as the explosion of Krakatoa—but never by flood waters of a large wave washing across the continent for thousands of miles. No such huge earthquake or explosion of a volcano is mentioned in the Bible, so postulating a tsunami to cause widespread rapid erosion across the world and at the bottom of the Grand Canyon at the beginning of Noah’s Flood is without biblical or scientific support (Collins 2017). If the sedimentary rocks in the Grand Canyon were all deposited by Noah’s worldwide flood, then these rocks should all be deposited in less than one year under water and show continuous deposition from one formation to the next up the canyon walls without disruption. But that is not the case. For example, the Redwall limestone formation has ancient karst topography with caves and sinkholes, indicating that this formation was once lifted out of the water so that percolating rain water dissolved out cavities and tunnels in the limestone; erosion channels of the Temple Butte Formation, as much as 100 feet deep, cut the top of the Muav limestone, and networks of channels of the Surprise Canyon Formation, up to a half mile wide and 400 feet deep, cut the top of the Redwall limestone, indicating that these rocks were exposed at the Earth’s surface to river erosion (Hill et al. 2016). These structural land surface features would take much more than one year to be formed. Thomas H. Huxley (1825–1895) said the following: “The great tragedy of science—the slaying of a beautiful hypothesis by an ugly fact.” Any one of the above twenty-one facts destroys the idea that Noah’s flood was a worldwide occurrence. Nevertheless, a local large flood in Mesopotamia in biblical times could have been possible (Collins 2009). Young-Earth creationists commonly point out that Jesus supported the existence of Noah’s flood (Luke 17:27; Matthew 24:38–39), but in the context of the time in which Jesus lived, the translation of the Hebrew word ertz would have been understood as “land” and not the whole world. In that sense, all the land that Noah could have normally seen would have been under water in that part of Mesopotamia and that would have been in effect his whole world. During large floods in Iraq (Mesopotamia), commonly abundant rain falling in the adjacent Zagros Mountains goes underground in solution tunnels in limestone beds and emerges as gushing water in springs in Iraq. These springs are likely the “fountains of the great deep” as described in Genesis 7:11 (Hill 2015). Collins, L.G. 2006. Time to accumulate chloride ions in the world’s oceans. Creationism’s young Earth not supported. Reports of the National Center for Science Education 26(5): 16–24. Available online at http://www.csun.edu/~vcgeo005/collins.pdf. ———. 2009. Yes, Noah’s flood may have happened but not over the whole earth. Reports of the National Center for Science Education 29(5): 38–41. Available online at http://www.csun.edu/~vcgeo005/Collins2.pdf. ———. 2012. More geologic reasons Noah’s flood never happened. Reports of the National Center for Science Education 32(6): 1–11. Available online at http://www.csun.edu/~vcgeo005/Collins3.pdf. ———. 2015a. Can flood geology and catastrophic plate tectonics explain sedimentary rocks? Available online at http://www.csun.edu/~vcgeo005/Collins5.pdf. ———. 2015b. When was Grand Canyon carved—millions of years ago or thousands of years ago? How do we know? Reports of the National Center for Science Education 35(4): 2.1–2.8. Available online at http://www.csun.edu/~vcgeo005/GrandCanyon.pdf. ———. 2017. When was the Grand Canyon formed? 4,360 years ago during Noah’s flood? Or during millions of years by natural geologic processes. Power point presentation available online at http://www.csun.edu/~vcgeo005/PwrPt1.pdf and http://www.csun.edu/~vcgeo005/PwrPt2.pdf. Hill, C. 2002. The Noachian flood: Universal or local? Perspectives in Science and Christian Faith 54(3): 170–183. Available online at http://www.csun.edu/~vcgeo005/Carol%201.pdf. ———. 2015. A world view Approach to Science and Scripture (unpublished book). Hill, C., G. Davidson, T. Helble, et al. (editors). 2016. The Grand Canyon—Monument to an Ancient Earth – Can Noah’s Flood Explain the Grand Canyon? Kregel Publications. Hill, C., and S. Moshier. 2009. Flood geology and the Grand Canyon: A critique. Perspectives in Science and Christian Faith 61(2): 99–115. Available online at http://www.csun.edu/~vcgeo005/Carol%202.pdf. Nelson, S.A. 2012. Geology 212, petrology. Occurrence, Mineralogy, Texture, and Structures of Sedimentary Rocks. Available online at http://www.tulane.edu/~sanelson/eens212/sedrxintro.htm. Senter, P. 2011. The defeat of flood geology by flood geology. The ironic demonstration that there is no trace of the Genesis flood in the geologic record. Reports of the National Center for Science Education 31(3): 1–14. Available online at http://www.csun.edu/~vcgeo005/Flood%20geology.pdf. Lorence G. Collins is a retired professor of geology from California State University Northridge. He has thirty-six articles on the website Opposition to Creationism (http://www.csun.edu/~vcgeo005/creation.html) that describe various views of young-Earth creationists and their scientific errors in interpretations. Among these are three articles that discuss a bogus fossilized Noah’s ark in eastern Turkey.